On March 13, 2011 we had to make one of the hardest decisions we have ever had to make. We had to have our beloved Ollie put to sleep. He was severely colicky. Surgery was not an option. Our lives have not been the same since that day. He is sorely missed. We couldn't have asked for more gentle, kind stallion. He was always a gentleman. He taught us so much. 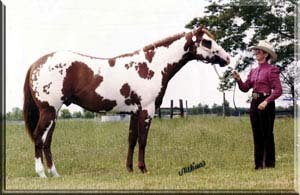 Ollie Norfleet was a 1987 sorrel overo stallion standing 16 hands. 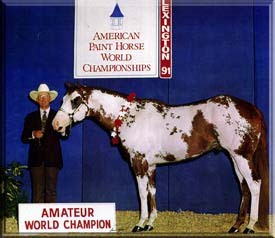 He was the 1991 APHA World Champion Amateur Aged Halter Stallion, 1992 NSBA High Point Open Limited Maturity Western Pleasure, 1992 #1 APHA Honor Roll Amateur Stallion. 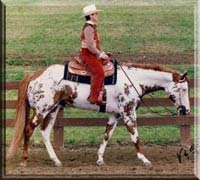 He was an APHA Superior All Around, APHA Champion, Amateur Champion, PtHA Champion, and had earned the APHA Performance Versatility award. 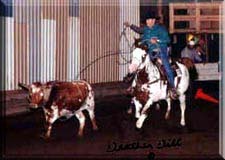 He had Superiors in Halter, Western Pleasure, Hunter Under Saddle and Trail. 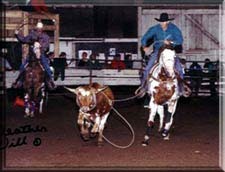 He had ROMs in Barrels and Heeling with points in Reining, Western Riding, Steer Stopping and Heading. Also, a World Show top 10 in Pleasure Driving. 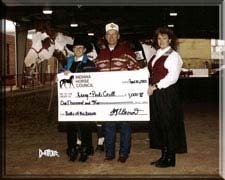 One of the biggest thrills for Crull's was when Ollie with Kenny were named World Champion Amateur Aged Stallion, placing 1st by three judges. 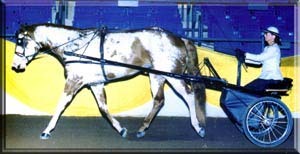 He also was named Reserve World Champion Overo Color and 8th overall in Pleasure Driving in his first competition driving. 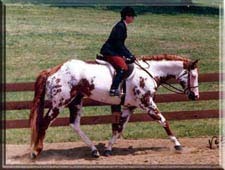 In 1992, Kenny & Ollie won the APHA #1 Honor Roll Amateur Stallion and was NSBA High Point Ltd Maturity Western Pleasure Horse with Pauli. 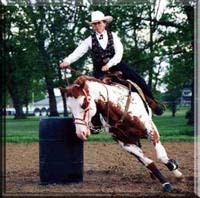 At the 1994 Hoosier Horse Fair, Ollie Norfleet was the winner of the "Battle of the Breeds" with Pauli, competing in Jumping, English and Western Pleasure, Obstacle Driving, Trail and Pole Bending. He also was part of the Paint Horse breed demonstration and carried the American flag in the opening ceremonies. All this was in April - right in the middle of breeding season!! 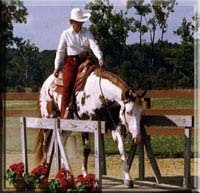 Ollie had been chosen to represent the American Paint Horse Association at Equitana three times. Ollie had a wonderful disposition. It is not unusual for Ollie to tease mares in the morning, get ridden in the afternoon by a novice rider (he had helped at least three 4-H'ers learn how to post on the correct diagonal) and then get collected later that afternoon to breed mares!! Ollie Norfleet consistently sired competitive horses with the size, color, conformation, disposition and all around ability it takes to win. 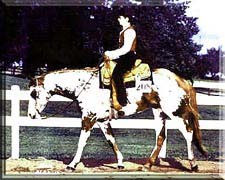 He was an APHA Leading Sire of Performance Horses that sires Honor Roll Halter Horses. 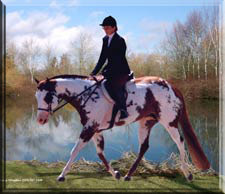 APHA World Show and Honor Roll Top Ten Youth, Amateur and Open Winners! !